The time has come – unfortunately in the midst of another political and human crisis – for the international community to develop a rapid assistance framework for nonviolent activists and dissidents who risk their lives to preserve their right to self-rule. Yesterday it was Ukraine. Today it is Crimea. In its editorial entitled Post-Crimea Relations with the West, published on March 18, The New York Times took issue with the legality of the referendum in Crimea that supposedly allowed the people of that Ukrainian province to approve the transfer of its sovereignty to Russia. But it also speculated that the “overwhelming majority of…Crimeans seemed to regard [the annexation of Crimea by Russia] as the righting of a historical anomaly,” without citing any evidence. Indeed, because the western media are treating Vladimir Putin’s physical take-over of Crimea as a fait accompli, they seem to regard the referendum as an ancillary procedure – whether or not it fairly ascertained the views of the majority of Crimeans. If the referendum did not mirror the wishes of Crimean voters, and if conditions in Crimea deteriorate as they did in Abkhazia and South Ossetia – two former pieces of the Soviet Union that Vladimir Putin chose to retrieve from Georgia - then perhaps, in the next six months or a year, the annexation might look less attractive not only for the majority of Ukrainians and Tatars living in Crimea but for ethnic Russians as well. This is even more likely to happen if an attractive arrangement is penned between Ukraine and the EU; then Crimeans’ regret may intensify if, as expected, the new local elite begins driving luxurious cars, building extravagant residences and otherwise mimicking the lifestyle that Moscow’s favoured ruling partners such as Victor Yanukovych have found irresistible. Ukrainians freed themselves from a corrupt and increasingly autocratic president through a campaign of civil resistance sustained over three months that was quite similar to the Orange Revolution in 2004. In both cases highly disruptive but nonviolent tactics including protests, sit-ins, and boycotts led to defections in the military and among other key Yanukovych political supporters. Assuming Putin does not seek to cleanse Crimea of its non-ethnic Russians, what would the west do if the current Crimean population began a campaign of civil resistance to reverse the referendum? Typically, authoritarian rulers reject the idea that outsiders have the right to interfere, based on the doctrine of sovereign immunity. However in this case, sovereignty is hardly settled and the typical claim that the West is seeking “regime change” rings hollow, since there has been less concern about Russia’s role in Crimea than about the way it was achieved. But if the West is concerned with Russia’s invasion of a neighboring country, why should it not be directly involved in facilitating the ability of the Crimean people to choose their rulers under fair, open and democratic conditions? Within a day after the invasion of Crimea on February 28, in a closed session of the Crimean parliament and under Russian military ‘protection,’ Sergey Aksyonov was annointed as the head of the new government. Yet just four years before, his pro-Russian party ‘Russian Unity’ had won only 4% of the votes in Crimean parliamentary elections. To cover this with the fig leaf of political sanction, a popular referendum was hurriedly staged only 18 days after Putin’s penetration of the province. It was as close a resemblance to a political “shot-gun marriage” as recent history offers – and as the following evidence reflects. Although Putin’s referendum implicitly acknowledged that the legitimacy of a government rests on the people’s consent, was the procedure legal and was the people’s consent really given? In regard to legality, Article 73 of the Ukrainian Constitution - which international law would recognize - required that “alterations to the territory of Ukraine shall be resolved exclusively by an all-Ukrainian referendum,” not one limited to a single province. Moreover, in 1994, both Russia and Ukraine signed an international agreement that guaranteed Ukraine’s territorial integrity in exchange for its surrender of the nuclear weapons in its possession. Russia’s act of invading Crimea, when incontestably it was Ukrainian territory, violated that agreement, which arguably contaminated the motives and arrangements for a referendum overseen by Russian occupiers. Both questions meant in practice the violation of Ukrainian territorial integrity. For example, the 1992 constitution (cited in question #2) was originally adopted that year by a Crimean parliament that had declared independence from both Russia and Ukraine. But it was supplanted by another constitution in 1995, which was frequently amended until 1999, when the primacy of the Ukrainian parliament over the Crimean constitution was firmly established. In other words, question #2 - reverting to a defunct constitution - did not offer Crimean voters a clear option to affirm Ukrainian sovereignty. Although the referendum was widely boycotted by most of the province’s native Tatar population and by pro-Ukraine voters, according to many reports, the reported outcome of the referendum was that 96.8% of ballots had been cast for the first question, with voter turn-out declared to be 83%. This approaches the famous level of support achieved by Saddam Hussein when he first stood for election as president of Iraq in 1995; a reported 99.96% of voters embraced him. But to be fair, is there any empirical, contextualizing evidence that makes the Crimea referendum outcome plausible, or does such evidence cast doubt on the credibility of the reported result? According to the 2001 official Crimean census, the population consisted of 58% ethnic Russians, 24% Ukrainians, 12% Tatars, and 6% others (Jews, Armenians, Greeks, Belarusians, etc. ), and there were no major changes in demographic composition in the ensuing 10 years. For the supposed referendum result­­ in both the percentage of the winning vote and total turn-out to have been accurate, all ethnic Russians would have had to vote in favour of question #1, plus virtually the entire Ukrainian minority in Crimea, despite the likelihood that a substantial number of Ukrainians would have voted to remain with Ukraine. There is more evidence. An opinion survey conducted in Crimea in spring 2013 (by The Gallup Organization, Baltic Surveys and IRI, with USAID support) showed that in May 2013, 53% of those polled supported Crimean autonomy within Ukraine (compared to 49% in 2011) and only 29% supported secession and joining Russia (compared to 33% in 2011). According to the same polling, only 15% of the Crimeans had a negative attitude towards the EU, while most people in Crimea (70%) had a neutral stance towards the EU. The Yanukovych regime’s talks to become associated with the EU lasted more than a year before an abrupt government U-turn in November 2013. If 96% of Crimeans had actually been yearning to turn to Russia instead of the EU, one might have expected protests against the lengthy flirtation of Ukraine with the EU, but nothing of the sort happened. In fact, an opinion poll conducted by the Kyiv International Institute of Sociology between February 8 to 18, 2014 (during the peak of the Maidan revolution in Ukraine) showed that in Crimea, public support for joining Russia was 41%. And this was after months of Russian propaganda in the media (most Crimeans watch Russian or the Ukrainian pro-government TV channels) about scary Ukrainian neo-fascists and ultra-nationalists in Kyiv. It is likely that Crimean support for joining Russia increased after Yanukovych’s departure on February 21, but it would have been highly implausible to have exceeded 50%. Similarly, no Crimeans rushed onto the streets to call for secession and annexation by Russia after Yanukovych lost his bid for the presidency in 2005, which was a direct result of the first Maidan uprising, the Orange Revolution. Finally, there were reported irregularities during the holding of the referendum, including bussing in voters from mainland Russia to increase both the turnout and the pro-Russia vote. In Sevastopol (according to a website that addresses misinformation about the conflict in Ukraine), to achieve the turnout announced at the end of voting, 124% of the residents of Sevastopol would have had to take part in the referendum, most of them naturally voting to join Russia. In the face of this evidence, it is reasonable to believe that had a free and internationally monitored referendum been organized in Crimea, without the ambiance of a Russian military occupation, but with all sides having equal access to the media, the results would have been different. Moreover, had four clear choices been presented – Russian annexation, independence, greater autonomy within Ukraine, or the status quo – it is improbable that annexation by Moscow would have gained even a majority of Crimean voters. Neither demographic arithmetic nor the widely perceived array of political opinions within Crimea before the Russian invasion support that thesis. The Ukrainian people had managed to create another type of “boots on the ground” to frame the implosion of Viktor Yanukovych’s presidency in February: the participation by millions of Ukrainian citizens in a three-month, predominantly nonviolent movement to demand a new presidential election and then ultimately the president’s resignation. 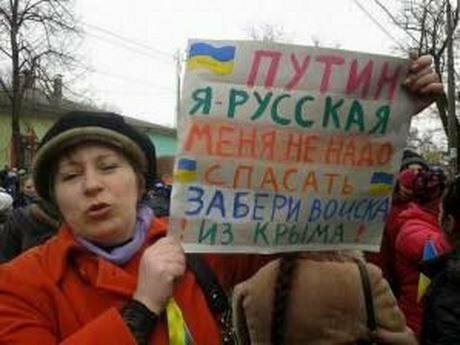 •	Protests of 15,000 women and children all over Crimea against the Russian military intervention occurred on a holiday popular both in Ukraine and Russia, International Women's Day on March 8 (see the videos). Protesters created a human chain to object to Russian military intervention on the peninsula. •	In the Crimean town, Yevpatoria, on March 3 local residents demanded that the Russian soldiers leave and insisted that they did not need their protection. •	Despite intimidation, Crimean intellectuals, including ethnic Russians, Ukrainians and Tatars, released a video a day before the referendum showing that they rejected Russian propaganda about conflict between Russians, Tatars and Ukrainians. They called for a united Ukraine and expressed their opposition to the separation of Crimea from Ukraine. •	Crimean activists organized a symbolic funeral of the freedom of speech in Crimea on the eve of the referendum. 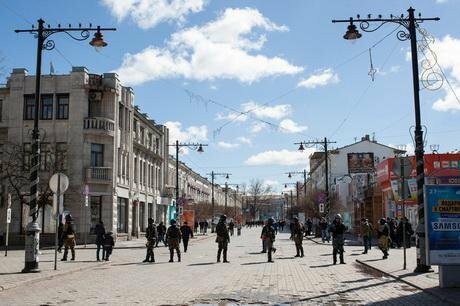 •	On March 13, a flash mob in Simferopol was organized to protest the referendum with activists sealing their mouths shut - a telling symbol of how the authorities tried to silence people to ensure victory for the pro-Russian camp. •	Some Crimean politicians, including the head of the Bahchisaraysky region, called for a boycott of the referendum. Some who went to the polling station protested by deliberately casting spoiled ballots. •	Social networking platforms, primarily Facebook, were also helpful in coordinating fundraising and aid efforts for the Ukrainian soldiers stationed in Crimea and Crimean activists. The Facebook page Crimea SOS has, at the time of this writing, more than 45,000 followers and close to 60,000 people who are talking about it on other Facebook pages, thus reaching hundreds of thousands of users. It will be up to activists like Neganov to develop effective strategies and tactics for civil resistance in Crimea by those who refuse to capitulate to a Russian future. The last century is studded with examples of successful civilian-based movements against military occupiers with local client regimes. But is there anything that the international community could do, to carry forward its own objection to military invasion as a form of claiming sovereignty over other lands and to support those whose rights have been diminished – and to do so in a way that is consistent with international law? There is a new initiative developing within the international community to set guidelines for external assistance for nonviolent activists and movements and to avert the hijacking of civil resistance campaigns by armed factions as happened so tragically in Syria. An interesting opportunity might arise should the Crimeans scramble for a low-risk way to demand a “do over” of the referendum many believe was fraudulent. The international community could help Ukrainian activists - through material assistance and know-how - to prepare an alternative citizens’ referendum in Crimea. It could leverage the underground network of dissidents and also existing civic structures, such as local universities, student groups, and the help of various minorities, together with the active involvement of ethnic Russians known to be lukewarm about the annexation of Crimea by its eastern neighbour. Such a signature drive would be akin to the ones led by the Tamarod movement in Egypt in May 2013 and the million signature campaign organized by Iranian women in 2009. In both cases, given the limits on public gatherings and repressive policies, the campaigns allowed people to visualize – through mass signatures – widespread public discontent with existing political and social conditions, and to discover the scale of true preference in their societies for major political change. This exercise in “preference discovery”, in turn, led to even greater civic mobilization and bolder demonstrations. It made people braver – to borrow a line from one of the Polish Solidarity leaders commenting on the impact of the visit of the Polish pope in 1978 to his native country that had suffered under communist dictatorship. With sufficient will the international community could also take other concrete steps. It could disseminate on a large scale educational toolkits highlighting successful cases and best practices of civic organizing under repression and occupation. It could provide Crimean activists (without the usual bureaucratic red-tape) with communication equipment, including laptops and satellite phones. It could help Ukrainians set up radio and TV broadcasts beaming uncensored information to the Crimean population, and assist the independent Tatar TV ATR to maintain its broadcasts despite increasing curbs and bureaucratic hurdles. It could work with the independent media to run effective information campaigns which would be helpful if, for example, a second referendum or signature gathering were to be organized. It could distribute hundreds of thousands of small handheld radios or even TV devices so Crimeans can receive the broadcasts and thus break through the effective blackout by regime-controlled media. The international community could construct a hotline created for activists to share information and coordinate tactics, including small and larger acts of civil resistance, cultural resistance and building underground civic institutions. Outsiders can also provide a safe venue for activists reaching out to those ‘latent double thinkers’ in different public institutions on the peninsula who will not express their views until someone else speaks up and creates new civic space via effective disruption. Such external assistance cannot be a substitute for an authentic grassroots movement. But the international community must do its own homework on how it can effectively help activists and dissidents that now live under the Russian flag via illegal and illegitimate occupations, not only in Crimea. The time has come – unfortunately in the midst of another political and human crisis – for the international community to develop a rapid assistance framework for nonviolent activists and dissidents who risk their lives to preserve their right to self-rule. Yesterday it was Ukraine. Today it is Crimea. Will those who are wringing their hands after the first military invasion in Europe in 46 years be ready to help the people who face the next threat to freedom?